HERTFORDSHIRE, England and PITTSBURGH, March 31, 2017 /PRNewswire/ -- Mylan N.V. (NASDAQ, TASE: MYL) today announced that Meridian Medical Technologies, a Pfizer company and Mylan's manufacturing partner for EpiPen® Auto-Injector, has expanded a voluntary recall of select lots of EpiPen (epinephrine injection, USP) and EpiPen Jr® (epinephrine injection, USP) Auto-Injectors to now include additional lots distributed in the U.S. and other markets in consultation with the U.S. Food and Drug Administration (FDA). This press release includes statements that constitute "forward-looking statements." 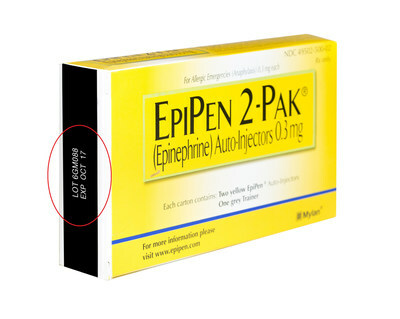 These statements are made pursuant to the safe harbor provisions of the Private Securities Litigation Reform Act of 1995 and include statements, among others, that select lots of EpiPen and EpiPen Jr Auto-Injectors will be recalled; that the recall will extend to locations outside the U.S., including additional markets in Europe, Asia, and North and South America; that Mylan is committed to replacing recalled devices at no cost and that patients will experience no additional replacement-related financial burden to them as a result of this recall. Because forward-looking statements inherently involve risks and uncertainties, actual future results may differ materially from those expressed or implied by such statements. Factors that could cause or contribute to such differences include, but are not limited to: the effect of any additional recalls of EpiPen and EpiPen Jr® Auto-Injectors; any changes in or difficulties with Mylan's or its partners' ability to develop, manufacture, and commercialize EpiPen and EpiPen Jr® Auto-Injectors or the authorized generic for EpiPen Auto-Injector; the effect of any changes in Mylan's or its partners' customer and supplier relationships and customer purchasing patterns; other changes in third-party relationships; the impact of competition; changes in the economic and financial conditions of the businesses of Mylan or its partners; the scope, timing, and outcome of any ongoing legal proceedings and the impact of any such proceedings on Mylan's or its partners' business; any regulatory, legal, or other impediments to Mylan's or its partners' ability to bring products to market; actions and decisions of healthcare and pharmaceutical regulators, and changes in healthcare and pharmaceutical laws and regulations, in the United States and abroad; Mylan's and its partners' ability to protect intellectual property and preserve intellectual property rights; risks associated with international operations; other uncertainties and matters beyond the control of management; and the other risks detailed in Mylan's filings with the Securities and Exchange Commission. Mylan undertakes no obligation to update these statements for revisions or changes after the date of this release.